Each new version of the iOS — the operating system that runs the iPhone — brings new features, bug fixes, and exciting changes to what your phone can do and how you use it. Upgrading to a new version of the iOS used to mean that you had to be in front of your computer, had to connect your iOS device to it, download the update to your computer, and then install the update by syncing with iTunes. Not anymore. 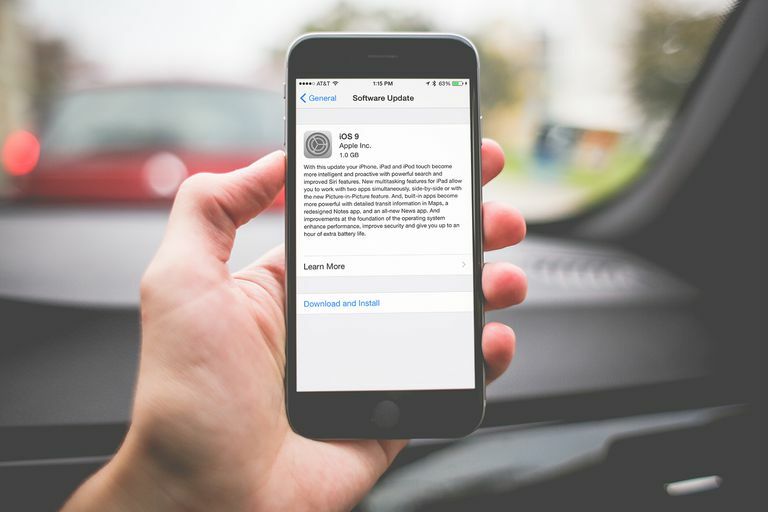 These days, you can install iOS updates wirelessly (a technique known as over-the-air, or OTA, updating). Because the iPhone, iPod touch, and iPad all run iOS, these instructions also apply to those devices. Back up your data to either iCloud or iTunes. It's always a good idea to have a backup of your latest data just in case something goes wrong with the upgrade and you need to restore your phone. Connect to a Wi-Fi network. While you could download an update over a cellular network, the updates are so big (often 1 GB or more) that you'll wait a really long time — and you'll eat up a ton of your monthly wireless data. Wi-Fi is much easier and faster. Just make sure you've got plenty of battery life. The download and installation process can take some time, so if you've got less then 50 percent battery, plug into a power source. Tap Software Update. Your device will check to see whether there's an update. If there is, it will report what it is and what the update will add to your device. Tap the Download and Install button at the bottom of the screen to begin installing the iPhone software update. If you have protected your phone with a passcode, you'll need to enter it here. The download begins. You'll see a blue progress bar moving across the screen. When the download is complete, you'll choose to either to install the update now or later. To install now, tap Install Now. Your device will now begin installing the update. First, it will verify the update with Apple's servers. Then the screen will turn black and show an Apple logo. A progress bar shows the status of the update. When the iOS update has finished installing, your iPhone will restart. After that, you'll be asked to enter your passcode, Apple ID password, and similar basic information to complete the upgrade and configuration. Do so. When the Home screen appears, you're ready to use your iPhone, with its freshly updated OS. Your iPhone will let you know when there's an update even if you don't check for it. If you see a little red 1 icon on the Settings app on your home screen, that means there's an iOS update available. You may also get a push notification. You may not have enough empty storage space available on your device to install the update. If you're in that situation, read How to Update iPhone When You Don't Have Enough Room for tips on how to fix this situation. If something goes wrong with the installation, you have two options for fixing things: Recovery Mode or (if things go really badly) DFU Mode. Another result of a failed upgrade can be a White Screen of Death.